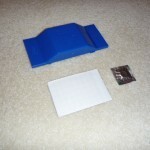 PRODUCT DESCRIPTION: Heavy duty pheromone trap that isolates the red flour beetles pheromone. Measuring 2.5" wide by 6.5" long and about 1" tall, it's design makes it both versatile and durable. Ideally designed for use in commercial facilities where red flour beetle invasions are always a threat, they will work well in any residential home too. Traps work by luring beetles into the middle holding pad and should last 3 months or more.